The purpose of this toolkit is to help users to identify some of the policy implications of a decision to harness Open Education Resources (OERs). It is designed to help users to review their own institutional policy environment and where necessary institute policy changes that will facilitate collaboration and the development and sharing of OERs. This toolkit examines key critical issues that need to be addressed using actual and modified examples. The toolkit space also provides a platform for interaction between individuals and institutions in identifying policy challenges and finding appropriate solutions through an engagement with a community of practice. Sections 1 below orients you to OER generally and OER-related policy considerations. Sections 3, 4, 5 , 6 and 7 each contain; a summary of key questions/issues; links to an illustrative case study/studies; relevant toolkits and examples of OER policy documents. Section 8 provides an overview of the policy links between OER and Open and Distance Learning and e-Learning. of policy-making and policy review. Section 10, OER Policy Forum, provides an interactive space in which you can raise questions, make suggestions and/or provide links to other useful policy resources. 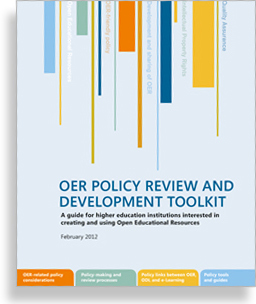 The purpose of this toolkit is to help higher education stakeholders to identify some of the policy implications of a decision to create, adapt and/or use Open Educational Resources (OER). The toolkit is designed to help you review your own institutional policy environment and where necessary institute policy changes that will facilitate collaboration and the development and sharing of OER. The concept of Open Educational Resources (OER) describes any educational resources (including curriculum maps, course materials, textbooks, streaming videos, multimedia applications, podcasts, and any other materials that have been designed for use in teaching and learning) that are openly available for use by educators and students, without an accompanying need to pay royalties or licence fees. Note that ‘OER’ is not synonymous with online learning or e-Learning; openly licensed content can be produced in any medium: printed text, video, audio or computer-based multimedia. The primary target audience for this space is educational decision-makers at African universities who have the responsibility of reviewing or developing institutional or faculty policy frameworks to facilitate development and sharing of OER. The toolkit examines critical OER policy-related issues that need to be addressed by, or may be of interest to a range of stakeholders: students, staff, institutions, government and/or quality assurance bodies and others. The toolkit will also be of interest to African government representatives, potential partners of OER Africa, researchers interested in OER in Africa and general-interest users.